“Wisdom” Teeth is the name given to the last or third molar in your mouth. They usually develop between the ages of 17 and 24 and can be removed for a variety of reasons. Sometimes when the teeth grow in, they are too close to the back of the jaw, allowing food particles to get stuck behind the tooth – out of the reach of a tooth brush or floss. Other reasons for removal include misalignment and overcrowding. There are two ways wisdom teeth can be removed. 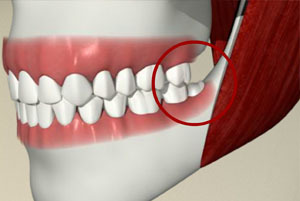 Most wisdom teeth are removed like other teeth. Patients are put under an anaesthetic and your dentist will widen the socket or area where the tooth is and remove the tooth. In other instances, the tooth has to be cut out. After receiving anesthesia, the dentist will cut the gums, remove the tooth and stitch up the wound.